Hi All! And a Very Happy Tuesday to you! Welcome to our March Sneak Peeks! 8-) We have lots of Fun inspiration to share Today through Friday. All of the new products will be available for purchase on Thursday, April 4th at 8 am PST. You'll find it all in the Fresh out of the Oven Department at the Taylored Expressions Store. 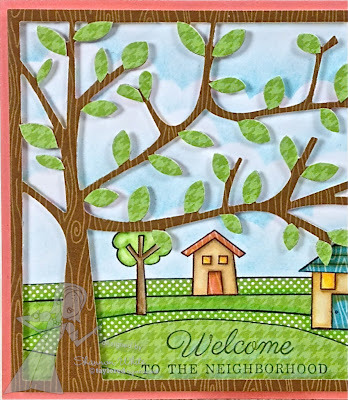 OMGosh can I just tell you I had so much fun putting together my Fun Welcome to the Neighborhood card! I just Love all the Sweet images in the Made in the Shade Stamp set! They are super Versatile and can be used year round for all kinds of occasions! Yay! LOVE that! 8-) I stamped my Adorable little houses with Memento Tuxedo Black onto Choice Snow White CS, did a bit of paper piecing & colored up the rest with my trusty Copics. Accckkkk I just adore those paper-pieced rolling hills in the different patterns - love them! And your Christmas card is so perfectly sweet! Can't wait to get playing with that window set! Oh Wow! Shannon, both these cards are stunningly beautiful! 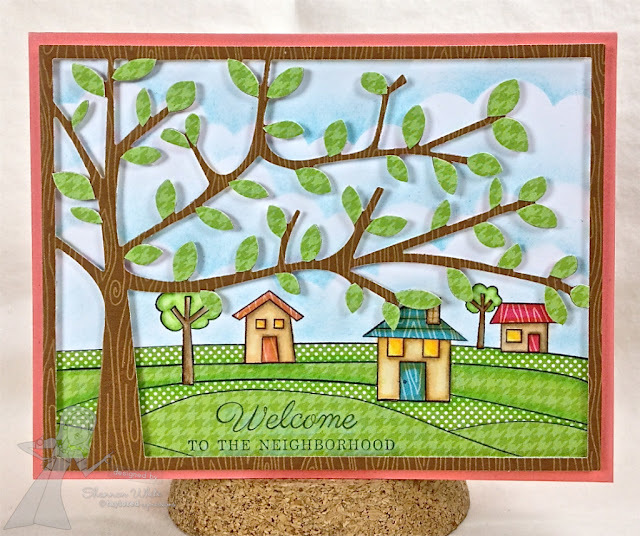 Your use of the die cuts and patterned paper is amazing! These are both so creative!! Love the second one so much!! Shannon, that first card reminds me of a sampler!!! Delightful! Love the Christmas "looking through the window" card too. VERY pretty. WOW beautiful creations Shannon!! I absolutely love the little scene you've created on your first card! AND your window card is gorgeous, beautiful dies! I LOVE both of your projects soooo much!!! 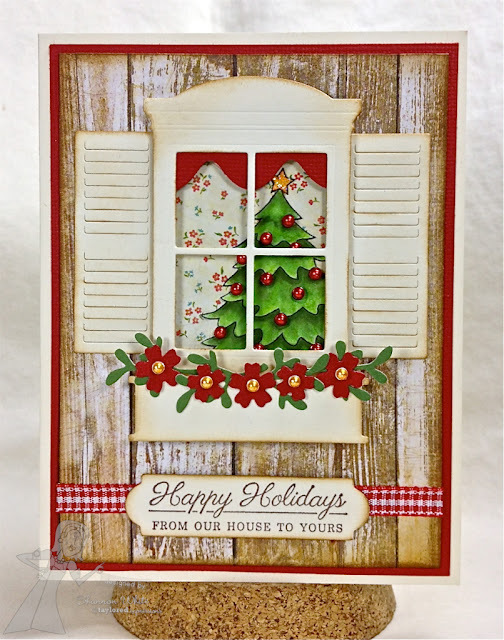 Those paper pieced hills with the polka dots are so adorable, and your Christmas card with that fab planked dp background and the window swag and the "wallpaper" and the pearls and flowers, and SWOON!!! Oh my that Christmas card is ADORABLE, LOVE THE SHUTTERS and the tree in the window!!! LOVE IT!! 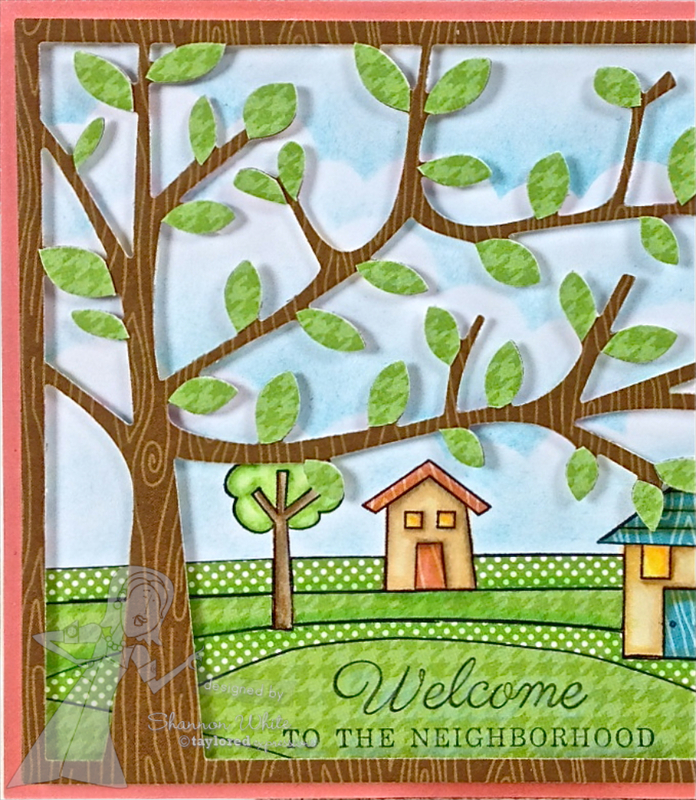 And your welcome to the neighborhood card is wonderful, love the paper pieced homes. Wow!!! Wow! Love that tree with all the leaves! Cute little houses, too! 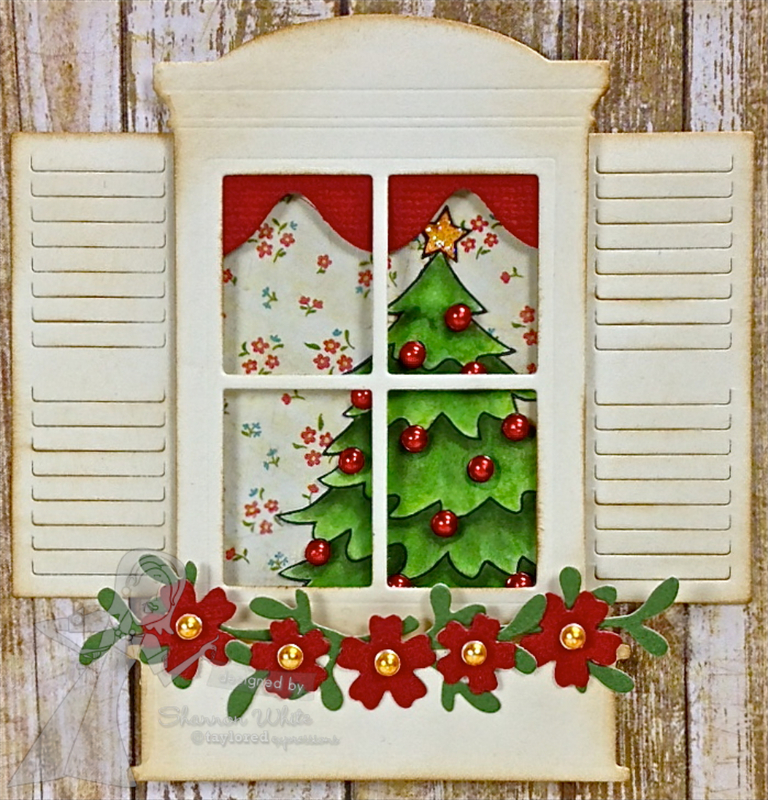 And, amazing Christmas card with the window scene! I have been eyeing that die...love it! Take care, hugs! What a wonderful way to welcome someone new to the neighborhood with a sweet little card like this! It's such a cute scene, and the Christmas tree in the window is fabulous!! Great cards Great scenes. I love your work and your use of the dies and images.. Really stunning. wow, what gorgeous scenes you created. I love how you did the first one. What a fab job Shannon!! I love the fun little scene with the very cool tree. The second Christmas window is beautiful! Love them both. Wonderful projects! I love the Christmas window. Beautiful cards and I love that pretty window die!!! Oh my goodness. What a gorgeous scene and your tree is awesome. Your Christmas card is equally beautiful and your cute little curtains caught my eye. Beautiful cards Shannon! I love the window and accessories dies! Such a neat set. The matching stamps are fabulous! I also love the pretty tree! Oh, my... those sweet little flowers are just perfect. Lovely colors and patter papers on both cards girl! Gorgeous, Shannon! The first scene is amazing - love the piecing! And wowzers, fabulous Christmas card - love the mix of dies! More cuteness with your dies and paper piecing and fabulous coloring! Love all these dies. Great idea to use the big ric rac die for a window swag. Very fun cards, both! I absolutely LOVE your attention to detail, Shannon! The Shade Tree Cutting Plate being cut out of wood grain paper...priceless! 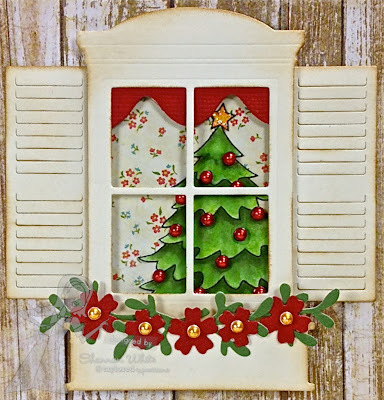 And the window scene showing off that gorgeous Christmas tree, love it! You are sooo uber talented, my friend!